“Climate scientist Peter Gleick has acknowledged that he was the person who convinced the Heartland Institute to hand over the contents of its January Board package, authenticating the documents beyond a doubt and further exposing the disinformation campaign Heartland has pursued in the last week, trying to discredit the information,” writes DeSmog Blog in a post titled “Whistleblower Authenticates Heartland Documents” (Feb. 20, 2012). More importantly, contrary to DeSmog’s spin, Gleick does not claim to authenticate the document titled “Confidential Memo: Heartland 2012 Climate Strategy,” the only document among those posted on the DeSmog Web site that even vaguely resembles the stuff of scandal. Even more pathetic is the sanctimonious open letter by Michael Mann and six colleagues who suggest that Heartland merely got its comeuppance for cheering and publicizing the release of the Climate Research Unit (CRU) emails that sparked the Climategate scandal. As noted here last week, there is good reason to believe the climate strategy memo, which purports to be a confidential communication to a “subset of Institute Board and senior staff,” is a fake. The memo says, “We will also pursue additional support from the Charles G. Koch Foundation. They returned as a Heartland donor in 2011 with a contribution of $200,000.” But one of the bona fide stolen board meeting documents, Heartland’s 2012 Fund Raising Plan (p. 22), shows that Koch donated $25,000 in 2011, not $200,000, and for Heartland’s health care program, not its climate science program. Heartland seeks a $200,000 donation from Koch in 2012 — for its health care program, not its climate program. In short, the alleged strategy memo gets basic information — how much Koch contributed and for which program activities — stunningly wrong. It is almost inconceivable that Heartland would have mailed to key board members and staff a document so egregiously inconsistent with the Institute’s 2012 Fund Raising Plan. Megan McCardle of The Atlantic reported another reason to be suspicious of the strategy memo. Electronic analysis of the document indicates it was created by someone living in the Pacific time zone, unlike the other documents (aside from the IRS 1099 form), which were created in the Central time zone, where Heartland is headquartered. Just by the bye, Peter Gleick’s organization, the Pacific Institute, is located in the Pacific time zone. Given the potential impact however, I attempted to confirm the accuracy of the information in this document. In an effort to do so, and in a serious lapse of my own and professional judgment and ethics, I solicited and received additional materials directly from the Heartland Institute under someone else’s name. The materials the Heartland Institute sent to me confirmed many of the facts in the original document, including especially their 2012 fundraising strategy and budget. I forwarded, anonymously, the documents I had received to a set of journalists and experts working on climate issues. I can explicitly confirm, as can the Heartland Institute, that the documents they emailed to me are identical to the documents that have been made public. I made no changes or alterations of any kind to any of the Heartland Institute documents or to the original anonymous communication [emphasis added]. The materials Heartland sent Gleick ‘confirm many of the facts’ in the strategy memo because the memo is mostly a pastiche of phrases taken from other documents. But note, Gleick does not say that Heartland mailed him the strategy memo. He also implicitly acknowledges that not all the facts in the strategy memo are confirmed by the other documents. Indeed, as we have seen, the 2012 Fund Raising Plan conflicts with the strategy memo’s assertions regarding the amount and kind of Koch’s 2011 donation. The only part of the strategy memo that comes even close to scandalous (unless you make the question-begging assumption — Gleick apparently does — that climate skeptics are a scandalous bunch) is the statement that “it is important to keep” scientists like Gleick “out” of Forbes magazine. Spotlighting this statement, DeSmog Blog accused Heartland of hypocrisy, because the Institute had blasted CRU scientists for trying to keep skeptics out of the peer reviewed literature. But the statement in question is so silly it casts additional doubt on the strategy memo’s authenticity. How on earth could Heartland keep opposing views out of Forbes? Is Heartland the think-tank tail that wags the financial-empire dog? The “confidential” memo implies that when Heartland President Joe Bast says “jump,” Steve Forbes says “How high?” Anyone credulous enough to believe that probably also believes global warming is a planetary emergency even though annual deaths and death rates related to extreme weather have declined by 93% and 98%, respectively, since the 1920s. So although we can agree that stealing documents and posting them online is not an acceptable practice, we would be remiss if we did not point out that the Heartland Institute has had no qualms about utilizing and distorting emails stolen from scientists. The Climategate Seven compare apples to oranges — an old rhetorical trick that has no place in scientific discourse. Michael Mann and the CRU gang are funded by taxpayers. Consequently, their data, methodologies, and work-related email are subject to freedom of information laws. The Heartland Institute is a privately-funded organization. Consequently, its internal decision and planning documents are not subject to FOIA. As we know from the Climategate emails, Phil Jones and CRU scientists stonewalled FOIA requests for years to prevent independent researchers from checking their data and methodologies. That was a bona fide scandal, not only because such conduct is prima facie illegal, but also because scientists who deny independent researchers the opportunity to reproduce (invalidate) their results attack the very heart of the scientific enterprise. Leaking the CRU emails — for all we know the work of a genuine whistle blower — was the only way to (a) produce documents responsive to valid FOIA requests, (b) expose CRU’s willful evasion of FOIA, and (c) subject CRU research products to the indispensable test of reproducibility. There is no analogy between Climategate and the theft of the Heartland documents because (1) Heartland has no legal obligation to share its internal deliberations with the public, and (2) unlike collusion to evade FOIA, strategizing about how to raise money is not a violation of either law or professional ethics. 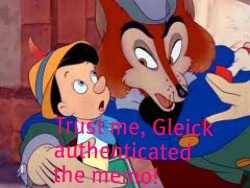 Update: Steven Mosher speculates, based on textual analysis, that Gleick wrote the fake strategy memo he claims was sent to him by an anonymous source. See Mosher’s comment #89946 on The Blackboard and related threads at ClimateAudit.Org: comment #342939, comment #324959, and comment #325062. But wait, there’s more: I have written numerous online articles about the long-term smear of skeptic climate scientists, including two right here at GW.org ( http://www.globalwarming.org/author/russell-cook/ ), and the central character in them is anti-skeptic book author Ross Gelbspan. Guess who is the star blogger at Desmogblog? Ross Gelbspan. Also: Thanks to Fakegate, everyone now knows that the “center of climate change denial” (NYT Feb 21, 2012) is not financed by Big Oil. A third major distinction between Climategate and Fakegate, is that 3) the most embarrassing statements in the Climategate e-mails were actually written by the people listed as their authors. In Fakegate, the most embarrassing document was written by a lying, thieving, misrepresenting, political opponent, trying to impersonate and misrepresent his “enemies” with false and scurrilous statements. And a fourth 4) Climategate was shunned by the media for a long time, because they didn’t want to believe their cult’s leaders could ever do anything wrong or commit scientific malpractice, whereas in this case, the FORGED document was seized upon immediately, and propagated by the Alarmist media outlets and “friendly” blogs without any hesitation or journalistic care. Dr. Gleick (I suspect) is beginning to realize the full import and depth of his error. But others, like Richard Littlemore, Phil Plait and Black at the BBC still don’t realize the damage they’re doing to themselves, and continue digging. Mark my words, their credibility will be a long time in returning after this.